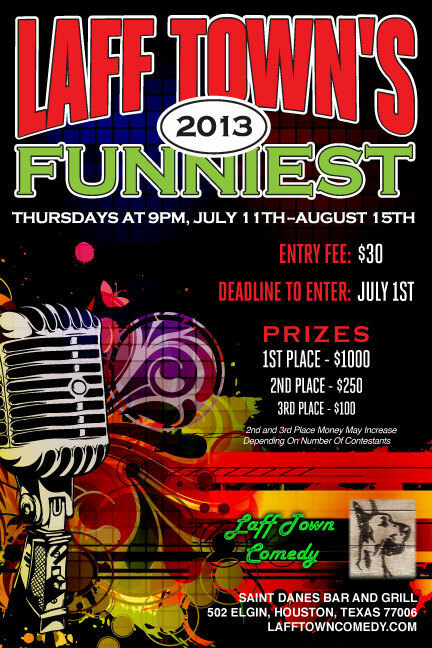 Laff Town Comedy and Saint Danes Bar and Grill have teamed up to put together a summertime comedy contest. It will take place at Saint Danes, 502 Elgin, on Thursdays starting July 11th. The competition is 6 weeks long with the preliminary rounds on July 11th, 18th, 25, and August 1st. The semi-final round is on August 8th and the Finals will take place on August 15th. Each night the contest will begin at 9 pm. The contest is open to anyone 18 and over. Sixty is the maximum amount of contestants and the deadline to enter July 1st. The guaranteed prize money for 1st place is $1000, 2nd place $250 and 3rd place is $100. 2nd and 3rd place money may increase depending on number of contestants. For more information and all contest rules visit www.lafftowncomedy.com.